Coastal areas are the link between the land and the sea. Coastal areas are complex productive marine systems and undergo constant environmental changes from tides and climatic cycles. Coastal biodiversity is the greatest on the planet, with many land and marine species also dependent on coastal habitats for part of their life cycle. The coasts are now subject to increasing pressures from human development, activities and pollution, with more and more people living in or using the coastal areas and relying on coastal resources. Impacts of climate change, in particular sea level rise, is bringing major future changes to coastal areas. This makes coastal management a wicked problem. How do we balance human needs and well being with sustainable thriving coastal environments and wildlife in the long-term? 1. SPATIAL ECOLOGY How do wildlife use the coastal areas and what space and habitats do they need? 2. ANTHROPOGENIC IMPACTS What are the cumulative impacts of coastal development and increased human activities on coastal habitats and species and how do we spatially model these? 3. STAKEHOLDERS' VALUES What and where are the values that people hold of an area? How can we map them and incorporate them in the decision-support tools? 4. 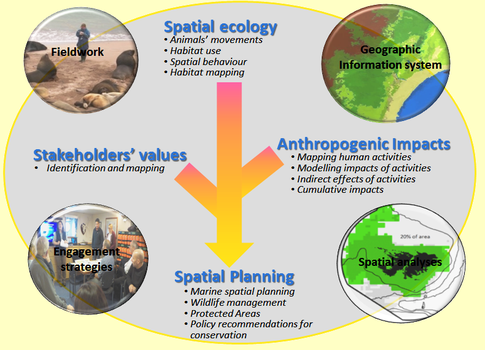 SPATIAL PLANNING Where can spatial planning improve coastal management now and in the future and how do we effectively provide recommendations to and influence stakeholders and decision makers? Marine litter is a worldwide problem that is increasing. 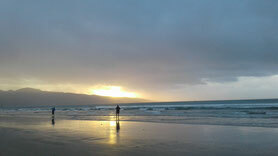 New Zealand has but studies in teh Far North have been very minimum to date. This summer project intends to survey several beaches around the Far North to assess type and quantity of litter. At the same time, we are also testing the protocol (app and data types) provided by Sustainable Coastlines who are developing citizen science to conduct beach surveys as a mean to get a large spatio-temporal dataset. We recently completed and published a study using local ecological knowledge to investigate the recovery of the Falklands' baleen whales to fill the lack of historic scientific data. We are now working on a follow up study to determine whether LEK data can be used for predictive modeling of whale distribution around the Falkland Islands using Maxent. Coastal development not only affects the land part of the coastal zone but also direct and create a wide range of activities and pollution in the marine environment. Using Bayesian networks in a GIS framework, we spatially model the impacts that coastal development could have on 3 case studies in the Great Barrier Reef: seagrass, dugongs and grazer reef fish, based on expert elicitation, to inform coastal planning. Collaborators: Owen Woodberry (Bayesian Intelligence), Bob Pressey (ARC Center for Coral Reef Studies), Ann Nicholson (Monash University), and a number of case study experts. Planning requires an understanding of future changes; however, predicting changes dependent on highly volatile socio-economic factors is not reliable. There, we applied a scenario planning approach to understanding the range of possible future coastal development along the Great Barrier Reef. These scenarios can feed in a range of management tools, such as stakeholder engagement, coordination of planning all along the GBR, localised priority areas for protection, etc. Land use change models were produced for the entire coast, along with models of their consequences for the marine environment (eg shipping, run-off etc). This project is a follow up from Veronica's MSc thesis. 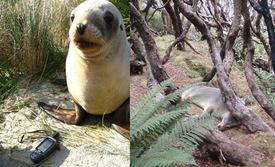 Following a paper presenting a new framework to model species with multiple behavioural states over time, we are now working on a paper that will present the results of the identification of suitable sites for breeding colonies throughout New Zealand coasts. This will provide the Department of Conservation and local councils with recommendations for planning, as well as linking land and sea habitat needs. 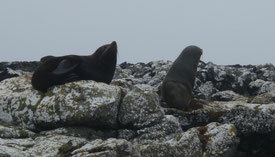 New Zealand fur seals have re-established breeding colonies along most of New Zealand mainland coasts in the last 2 decades following their extirpation in the 19th century. The last area where they have only started coming back is Northland. There has not been any study on the extent where they now occur and whether there are breeding colonies yet. We will be using local ecological knowledge and existing sightings to gain a on this species in Northland to provide understanding of potential benefits and issues their presence may bring for the region. 2018 student report available HERE. I created this website to describe my research interests, projects, and activities. Opinions are my own. All photos (apart from those of me...) on this website are mine (feel free to use them with acknowledgements ©Amelie Auge). If you would like to contact me, my permanent email is amelie.auge@gmail.com.